Synchronizing your bookmarks saves them to your Google Account. By doing this, you can access and edit them on any computer by logging into your Google Account. Along with synchronizing extensions, apps, themes, and browser preferences, bookmark synchronization gives you the same browsing experience at work, at home, or anywhere else you're using a computer connected to the Internet. Click on the Wrench icon and select Options (Windows OS) or Preferences (Mac and Linux OSs). In the Options/Preferences menu, select Personal Stuff from the index at the left side of the page. In the Sync section, click on the Set Up Sync... button. Enter your Google Account username and password and click Sign in. 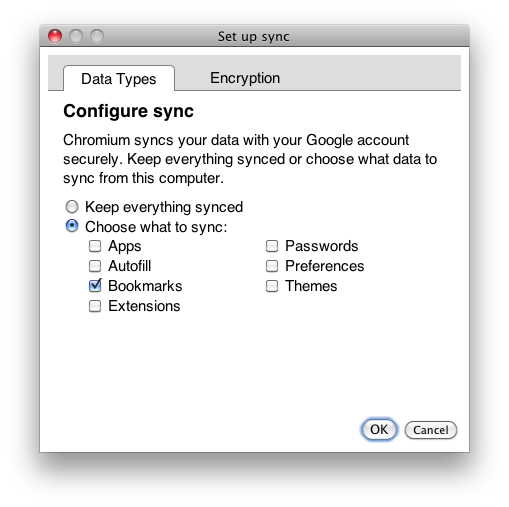 In the Configure Sync section of the pop-up window, click on Choose what to sync. Ensure that Bookmarks is selected, and click OK. In the Sync section, click on Stop syncing to this account. Click on Stop syncing in the confirmation dialog box.